These simple, healthy, and delicious muffins are made with fresh strawberries and whole wheat flour. Medium Sized Lemon- 1 no. • Preheat oven at 200°C. • Coat muffin cups with a little oil or butter paper. • Peel the long lemon zest with a peeler. • Pulse the zest and sugar together in a blender to make lemon-powdered sugar. • Beat oil, sugar, buttermilk, and eggs together with a beater. • Sieve whole wheat flour, refined flour, baking powder, baking soda, and salt together thrice. • Fold in the buttermilk mixture to the flour to make a dropping consistency batter. 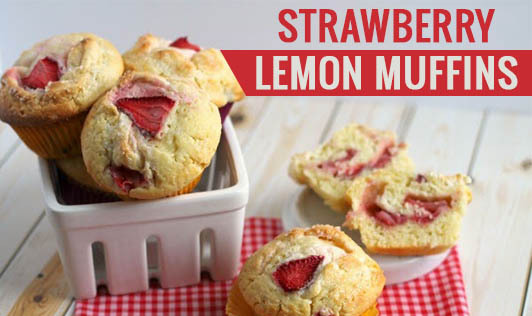 • Gently fold in the strawberries and add the batter in the muffin cups. • Bake the muffins for 20 to 25 minutes or until the edges are golden brown. Let them cool for 5 to10 minutes. • De-mold and serve warm.